Brown spots that develop on the face and body are often age spots caused by the natural aging process. These spots are typically the result of an excess production of skin pigment or melanin. Sun exposure, aging, and forms of ultraviolet light exposure like tanning beds and contribute to the development of age spots or liver spots. Fortunately, there are a number of safe non-invasive treatments designed to improve pigmentation on face and body. One way to effectively treat uneven skin tone and brown spots on face is with the VI Peel. This potent chemical peel uses medical-grade ingredients such as TCA (Trichloroacetic Acid), Salicylic Acid, Retin-A and Vitamin C that penetrates deep into the skin to exfoliate the skin and stimulate collagen. VI Peel is also effective in treating acne, acne scars and sun spots as well as reducing the appearance of fine lines and wrinkles. It is safe and effective on all skin types and takes at least 30 minutes to an hour per session depending on the size of the area. After the procedure, you will experience a significant peeling on the third day which may last for five to seven days. You will also be given post peel cream to help reduce any discomfort from the peeling. Once the peeling is completed, you will notice that your skin looks healthier, brighter and smoother. A Limelight Facial is another popular way to get rid of undesirable brown spots on the skin. Limelight uses “intense pulsed light” (IPL) to target pigmentation drawing out brown spots from a deeper layer of the skin. During the skin lightening treatment, this FDA-cleared pulse light is delivered to the skin which are then absorbed by the pigments and small blood vessels. The procedure gives a mild pinching sensation similar to a rubber band snapping on your skin. Your brown spots and freckles may turn darker to coffee brown after the procedure which nothing to worry about as it is very common post effect. The treated area will then flake off after a week. LimeLight is ideal for any part of your face, neck and décolleté with skin redness, tiny veins, freckles or brown spots. The result can be seen after one or three weeks. The pigmentations will fade and diminish leaving the skin clearer and brighter. At least four treatments are recommended for a noticeable skin lightening of the brown spots resulting in a more youthful and clearer complexion. The Pearl procedure uses FDA-cleared resurfacing laser technology to safely treat sun-damaged and aging skin. Pearl has also been found effective in reducing acne scars and wrinkles, improving uneven skin texture, and reversing the solar damage. During the procedure, the top layer of skin is treated using pulses of light that simultaneously send heat to varying layers of skin. This triggers the body’s healing process wherein a natural protective dressing forms on the skin to minimize the downtime. After a week, this natural dressing will peel off revealing a healthier, new skin with a “Pearly” glow. Although there is a downtime of at least five to seven days with Pearl Resurfacing, you will be able to see significant improvement in your skin tone and texture with just one treatment. The Obagi Skin Lightening is a safe and powerful pigmentation removal program that lightens, exfoliates, and balances the skin. Using clinical grade ingredients this three-step program have been found especially useful in treating brown spots and other pigmentation. This 3-step program can be simply added to your daily skincare routine – normally after cleansing and toning. Obagi Clear (#3) contains 4 percent hydroquinone to correct unwanted pigmentation. Obagi Exfoliator Forte (#4) contains 14 percent alpha-hydroxy (AHA) to improve your skin texture. The final step is the Obagi Blender (#5) which also contains hydroquinone but goes deeper into the skin to achieve a more skin brightening effect. It is important to take note that these 3-step program is only available with a prescription from Dr. Sylvia Ramirez, our Harvard-trained aesthetic doctor. Certain oral supplements containing Phytofloral and Tranexamic acid have been found in clinical studies to be safe and effective in treating brown spots and melasma on the skin. Phytofloral is a natural antioxidant that comes from non-chemical processed tomatoes with colorless carotenoids (the only type that can absorb UVA and UVB light and are the only carotenoids in nature that are colorless). Phytofloral lightens the skin by protecting it from environmental damage which causes sunburn, age spots and pigmentation. Tranexamic acid on the other hand, is made from an amino acid (protein) called lysine which was discovered in clinical studies to reduce melasma safely if used in lower concentrations. These ingredients can be found in Diamond Tomato Rx, a safe and natural dietary supplement that has been found to help maintain healthy, radiant skin starting from within. The supplement works to protect the skin from sun damage and environmental toxins while also reducing skin pigmentation. Best of all, it will not stain or bleach the skin and features antioxidant and anti-inflammatory properties. 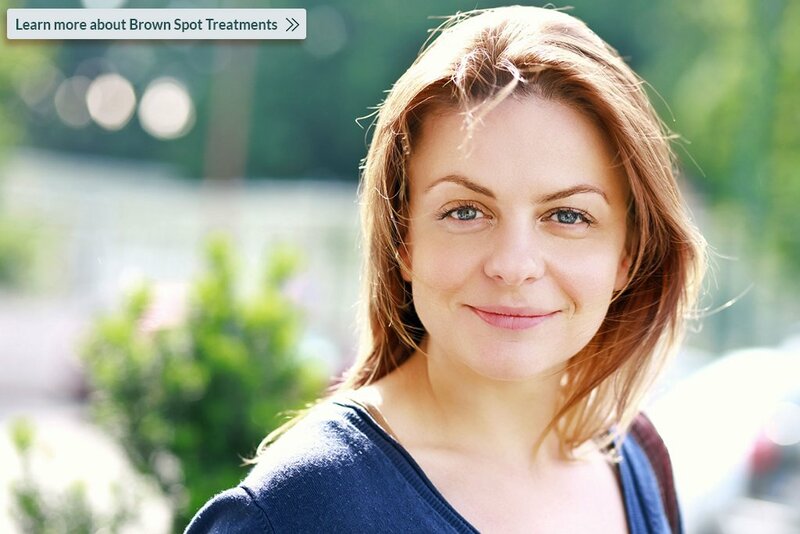 From common freckles to darkened liver spots, brown spots can occur on the skin at any age. Understanding what causes them is important but knowing how to properly treat them matters. If you’ve tried every drugstore creams and lotions yet still do not get the results you are looking for, it’s time to consider a product or treatment that has been proven successful in reducing the appearance of pigmentation. To know if you are a good candidate for the mentioned treatments, please contact Cutis Laser Clinics today and schedule a consultation with our aesthetic doctor.